This simple-to-make French pie is beautiful and as delicious as it looks. 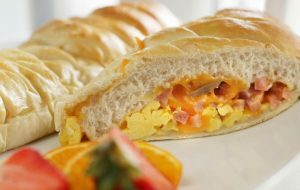 Use store-bought puff pastry and it’s a snap to put together. 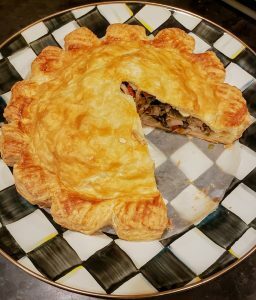 This recipe is for a savory chicken pie and you can also make sweet pithiviers. One example is the apricot filling below. Line a baking sheet with parchment paper. 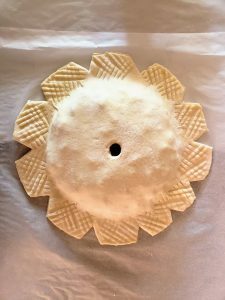 On a lightly floured surface, lightly roll one piece of puff pastry to about 1/8-inch thickness. Use a 9-inch cake pan to cut out a circle. Dock the surface (bottom crust). Repeat with remaining piece of puff pastry, except make this one 10 inches diameter and do not dock. Freeze rounds on prepared baking sheet while preparing filling. Filling: Heat butter in a large skillet and add onion; cook and stir until onions begin to soften. Add garlic and cook a few more minutes. Add flour; cook and stir a minute or two. Slowly whisk in chicken stock; bring to a simmer, and whisk at a simmer for a minute. Stir in chicken, ham, peppers, sun-dried tomatoes, thyme, and parsley. Refrigerate mixture until cold. Remove crusts from freezer and position bottom crust in center of baking sheet. (Set top crust aside.) Pile filling in middle of bottom crust, leaving a 1-inch border clean. Lightly and carefully brush just the top of this border with the beaten egg, being careful not to let the egg drip down the sides of the puff, which would seal the sides and keep the puff from rising. Now place the remaining round on top, carefully forming around the mounded filling. Press the two edges together lightly to seal. Use a paring knife to score the top crust in the traditional spiral pattern or crosshatch or a pattern of your choice. Make a hole in the very center of the top crust. Place in freezer for 30 minutes while oven preheats to 400º. Remove Pithiviers from freezer and brush the top with egg wash, again being careful not to let the egg drip down over edges of dough. Place in preheated oven. Turn oven down to 375º and bake until puffed and golden brown, about 45 minutes. Simmer apricots and water 15 minutes. Stir in sugar and return to simmer. Cover, simmer on low until very thick, about 15 minutes. Pithivier constructed and ready for the oven. 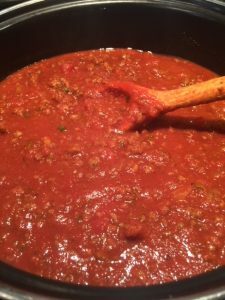 As my granddaughter, Taylor, says, “A recipe is just a guideline.” Especially true of my sauce recipe. The amounts don’t need to be exact. You might not have Italian sausage – Jimmy Dean breakfast sausage is fine. You might need to stretch the amount and add extra tomatoes. You can add more red wine, or leave it out. I bet you end up making this your own version! It’s an all-purpose sauce. Use it as-is on spaghetti, as sauce for Chicken Cacciatore, on meatball sandwiches, or wherever you need Italian sauce. In my kitchen, leftover sauce often finds its way as a base for vegetable soup (non-vegetarian). Freezer in freezer bags up to 2 months. Cook sausage and ground chuck in a large Dutch oven over medium heat, chopping with a spoon or spatula as it cooks. When meat is almost done, drain off fat and liquid. Add onion and garlic and cook until onion is tender. Add tomatoes, tomato paste, herbs, A-1 Sauce, beef broth, and red wine. Simmer on low heat for 30 to 45 minutes. Season with salt and pepper. *Such as rosemary, oregano, thyme, basil, savory, marjoram. Extra: Depending on what I’m using this sauce for, who will be eating it, and what I have on hand, I like to add capers (about 1 tablespoon), Kalamata olives, and/or extra slivered garlic. Brown sausage in a Paella pan or very large skillet. When done, remove to a platter. To the pan, add onion, garlic, and mushrooms and cook until soft. Add saffron and paprika and stir well to spread flavors. When rice is tender, stir in peas and then place shrimp on top, pushing down into hot mixture. Cook 5 – 10 minutes, or until shrimp is done. Turn heat to medium and cook, without stirring, for a few minutes to allow the rice to form a crust on the bottom of the pan. 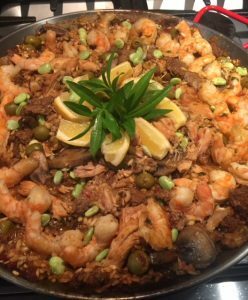 This crust is called “socarrar,” which means “to toast.” Don’t worry if you omit this step – your paella will be delicious no matter what.